Araneus species are typically moderate sized. They can be either brownish or colored brightly, especially orange or yellow. Their abdomens are generally more round, sometimes even somewhat triangular. 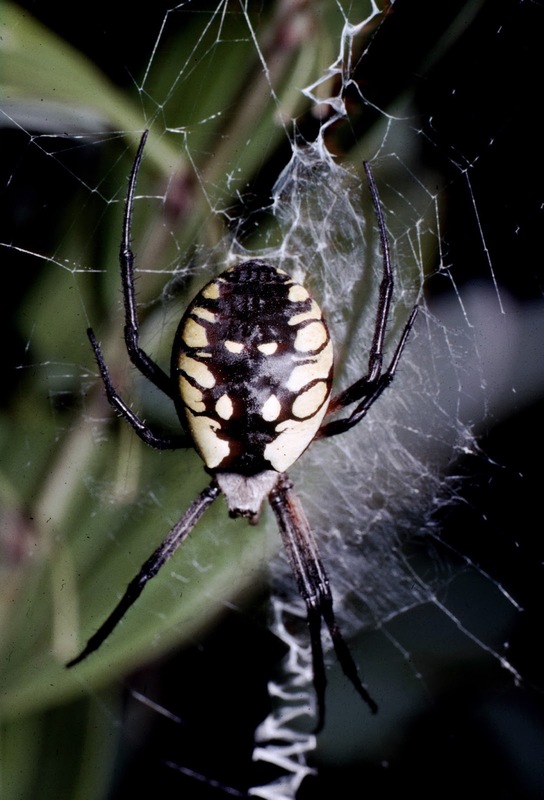 Common species include barn (orbweaver) spider, cross orbweaver, shamrock orbweaver, and marbled orbweaver. Click here to learn about other Araneus orb weaving spiders. Fortunately despite their appearance, orb weaving spiders are not aggressive or dangerous to people and no control is necessary. In fact, orb weaving spiders are fascinating to observe and people should consider themselves fortunate to have an orb weaving spider in their garden or yard to watch.